Log homes' energy efficiency is an important consideration when considering this building type. While many people are familiar with the challenges of energy efficient conventionally built homes, log homes present specific problems that must be carefully addressed in order to maintain an environmentally acceptable house. Several factors affect the energy efficiency of a log home. All must be addressed in order to create an energy efficient house as well as a home that meets current building codes. Air leakage is a common problem in homes that use insufficiency seasoned logs. Spaces between the logs increase as the logs continue to dry. The key to reducing shrinkage is to season logs for six months before beginning construction. Choosing a wood that resists shrinkage, such as cedar, spruce, or pine, is also an excellent way to reduce air leakage due to shrinking. Some manufacturers will also kiln dry logs to reduce the chance of significant shrinking. Another way to reduce air leakage is to use caulk or specially made gaskets between the logs. Each manufacturer has specific recommendations for their products: contact the manufacturer for more information. For those homeowners that have already installed caulk or gaskets in their log home, they should be aware that a qualified professional should regularly inspect these seals. Preserving the embodied energy of the log through preservation is also an important part of reducing energy consumption. For this reason, preventative measures should be taken to avoid insect and water damage. Common methods include waterproofing and treating the logs with insecticide. Adequate overhangs, gutters, and drainage are also important to preserve the logs for as long as possible from water damage. Although green building techniques are not regulated solely to log homes, using green building materials as well as a green home builder can easily increase the short term and long term energy efficiency of a log home. According to the United States' Department of Energy, the R-value for wood is .71 per inch for hardwoods, and 1.41 per inch for softwoods. This means that a six inch log wall would not met the R-value requirements for a home. A conventional wall made of wood stud framing has an R-value of 14. In order to increase the R-value, the thickness of the logs can be increased, or insulation can be added. These R-values also do not take into account the thermal mass of the log as well as the local climate. To obtain a building permit, the R-value of log homes must be addressed. 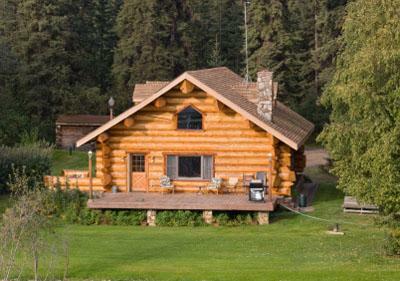 Some states have exemptions for log homes, while others recommend specific insulating techniques in order to meet building code requirements. Homeowners in some states can also petition for a permit under regulations that take thermal mass into consideration when determining R-value. The effect of thermal mass on the energy efficiency of log homes is difficult to quantify because it depends on the region and climate in which the house is constructed. In some climates, the logs will absorb heat during the day and radiate it slowly over the course of the night, reducing heating costs. It is important to research your climate in order to determine any thermal mass benefit a log home may offer. Due to the conflicting information available about log homes' energy efficiency, a prospective homeowner should not only gather information from manufacturers and neutral sources, such as the Department of Energy, but also from local log home owners. Someone who already owns a log home will be able to give you information about heating and cooling costs that are relevant to your region.